Hmm...It seems my mind is on sweets as of late. Looking through here, cookies, cookies, rice pudding. I can see I need to post a decent salad recipe again soon! I just had a delicious salad, by the way, with fresh squeezed lemon juice, cucumbers, mixed greens, and tomatoes. It tasted like summer! I digress, back to cookies and almonds. I have a fresh batch of Almond Flour and I decided to make a batch of Almond Flour chocolate chip cookies. These are a nice cookie choice for those doing an SCD or Paleo (specific carbohydrate diet - well, only if you skip the chocolate chips!) as there are no grain/starches added to this mix. The ingredients are rich, warm, and heavy! With all the natural fats of coconut, almonds, and the sweet honey we consider this a nice granola bar replacement. Besides that, it just tastes delicious! Simple and natural Almond Flour Cookies. Yum. Looking for more SCD desserts? Try Laura's SCD friendly Cookie Cake next! Yum. These look perfectly dunkable. Thanks! 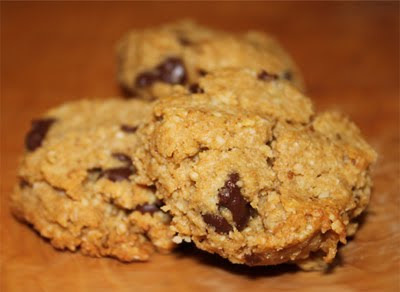 Tried these with what we had in the pantry and they worked out great :) Thanks so much! oh wow these came out amazing! Great recipe! I want to reach out and grab one of these cookies through the screen! Thanks for posting! I'm going to make these later today. omg what have you done to me? i've made these 4 times within the last month!!!! and here i am making my 5 batch! my bf ate 6 of them in one night! these are sooo amazingly good and i looove the texture. thank you! It looks delicious! Thanks for great recipe!